Just trying to catch up on reviews here! As usual, my adult books are all over the map as far as subject matter and genre. I like to mix it up--keeps me from getting bored! If I've been reading a lot of juvenile or teen lit, I usually need some nonfiction or something a bit meatier to balance it out. 4.5 stars: Proof that truth is stranger than fiction. I couldn't put it down! Okay, let me try to summarize this. So there was this eccentric guy, who happened to be the 5th Duke of Portland. He dug tons of tunnels under his estate, including an underground ballroom, he was a recluse who communicated with his staff only by letters, and he died in 1879. The last bit is probably the most important. Oh--perhaps it goes without saying, but he was fabulously wealthy. Since the 5th Duke had no children, upon his death the title, money, estate, etc., went to a cousin. Okay. Then there was a business man, by the name of T.C. Druce, who ran a well-known and successful Bazaar and had several children--some legitimate, some not. He died--supposedly--in 1864. 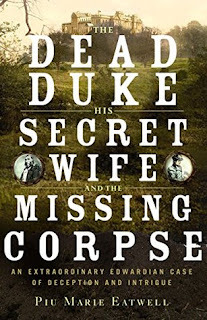 In 1898, Druce's daughter-in-law came to court asking for permission to exhume Druce, because--she claimed--Druce was actually an alter-ego of the 5th Duke of Portland, who had gotten tired of living a double life, and faked his (Druce's) death 30 years before. She insisted that the coffin would be empty, except for lead put in to mimic the weight of a body. Therefore, her son (Druce's oldest legitimate grandchild) would/should actually be the 6th Duke. Are you still with me? Druce's daughter-in-law received permission for the exhumation, but then was blocked in the courts by a brother-in-law--for reasons of his own. As time went on, she kept trying to get him dug up, stuck to her story, and even began referring to herself as the Dowager Duchess. Things just got more bizarre from there. This case was in the court system for 10 years! Nobody could figure out if Druce and the 5th Duke were one and the same or not. Meanwhile evidence and counter-evidence kept piling up on both sides, with no-one sure who or what to trust. By the way, yes, it did eventually get resolved. Craziness. 3 stars: Some good information, though I don't think I will make most of what she suggests. Reese lost her job and decided to help economize by making a lot more things from scratch. Then she began to realize that sometimes it's just worth it to buy it. So the journey began that created this book. With sections on all kinds of things from breakfast to junk food to cured meats, there are quite a few recipes here for the intrepid. Adventure cooking! This was a fun read for me, but then--I enjoy reading regular cookbooks (yes I know, I'm weird). This one had segments of stories interspersed with informational bits about the various items. 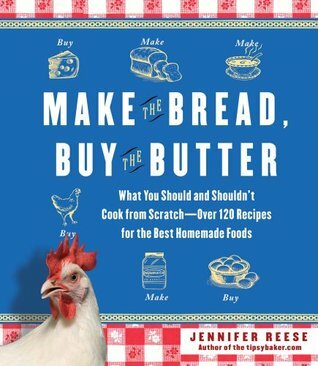 Recipes included, even if she recommends buying it. For each one she also includes hassle, and a cost comparison of purchased vs. homemade. She comes down pretty heavily on the homemade side. Some things I've already thought about making my own, like bagels, but some that have never occurred to me to even try--i.e., Worcestershire sauce. Anyway, I found it entertaining, and it gave me some good ideas. 4 stars: More depth than I expected, with WWI history woven into the narrative. 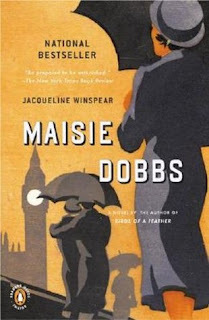 Maisie is a private investigator, hanging up her own shingle after WWI. She used to be a housemaid, but when her quick intelligence and thirst for learning became readily apparent, her employers paid for her to get an education. Then the War came along and she stopped school to go to the front as a nurse. One of her first cases is pretty simple--a man suspects his wife of infidelity. Maisie is able to solve the case without too many problems, but in so doing comes across something else that doesn't seem right. There are several veteran's graves in a cemetery marked with a first name only. The deeper she searches into this mystery, the more dark it becomes. When a personal connection comes up, she must act quickly to prevent a tragedy. This was different than most mysteries I've read, in that the case Maisie investigates is really almost tangential to the story. The real story is her life and upbringing, with a dash of mystery thrown in. The secondary mystery that became more important as the story went on also drew me in. There was a nice twist relating to her personal life. I will be interested to see how the later books compare to the first. This one relied quite heavily on flashbacks to tell Maisie's backstory, which presumably wouldn't be needed for the subsequent novels. What have you read lately that you can't stop talking about?